← You can, too, go home again — to Hannibal, Mo. Our waiter took this shot of us at Blue Sea, a sushi bar. Some of us were broadening our horizons. I’ve been to a bar or two in my life. OK, OK, the truth is, I’ve visited a lot of bars in my 62 years. I prefer to think of them as pubs; it sounds better. But Thursday night, March 31, 2011, marked my first visit to a sushi bar. Sherry and I had spent the week in fabulous Branson, Mo., and were headed home. We had stayed Saturday night, March 26, on the way to Branson, with our son Brendan and grandsons, Pierce and Cade, at their home in St. Peters, Mo., a St. Louis suburb. And we did the same thing March 31 on our return trip home. On the 26th, Sherry and I had treated everyone to dinner at the Village China Wok in St. Peters. 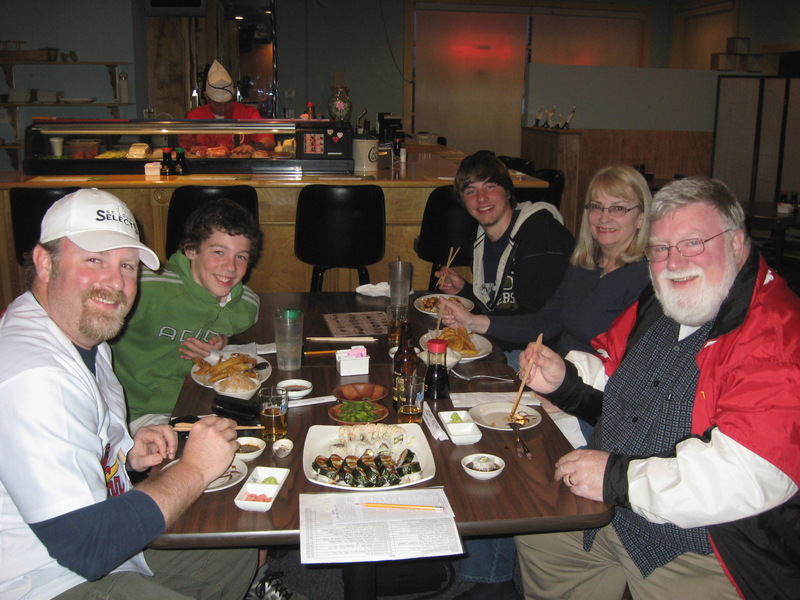 On the 31st Brendan said he was going to broaden our horizons and treat us to dinner at a sushi bar, Blue Sea in Chesterfield, Mo., also a St. Louis suburb. In my terms, it’s little cakes of fish — or something similar — surrounded by rice and wrapped in seaweed. Sushifaq.com says sushi began as a method of preserving fish centuries ago but has evolved into an artful, unique dining experience. “In its earliest form,” the website says, “dried fish was placed between two pieces of vinegared rice as a way of making it last. The nori (seaweed) was added later as a way to keep one’s fingers from getting sticky. The site also says, while sushi is not solely a Japanese invention, these days the Japanese style is considered the de facto serving standard. I’ve eaten a little sushi before at oriental buffets but never considered making a meal of it. But that’s what Brendan and I did at Blue Sea. While Sherry, Pierce and Cade ate more conventional meals, Brendan and I opted for the $25 all-you-can-eat sushi entree. A checklist was provided to us so we could order different varieties of it, and we certainly did. Shrimp, eel, squid, salmon and octopus are some that we tried. But before we ordered the sushi, Brendan suggested we have an appetizer. Now to me an appetizer is chicken wings, onion rings, fried mushrooms, cheese sticks and the like. But those items apparently don’t fly for someone broadening his horizons at a sushi bar. Brendan ordered two bowls of edamame — that’s a fancy name for green soybeans. Edamame in pods, I was instructed, is eaten by squeezing the beans out of pods with one’s fingers. Edamame is OK, but I’m not really a fan of it. Perhaps that’s because the first time I ever ate it I was uneducated about it and, thinking it was merely peas in a pod, ate both the soybeans and the pods — with disappointing taste results. This time I ate only the beans, which I found tolerable, particularly when washed down by Sapporo beer. The sushi, taken by itself, also was good but seemed a bit bland for my taste buds. So I spiced them up by dipping them into a bowl of soy sauce. Soy sauce and I go back a long way. Whenever I have rice, I drench it with soy. Yummm! I started the evening at Blue Sea using — or, actually, trying to use — chopsticks. But my only success was spearing food items with them. So I soon switched to silverware. The bottom line for our night at Blue Sea is that I got full on sushi and broadened my horizons in doing so. I also may have avoided gaining weight that night, something I certainly can’t say after every meal. “Is sushi healthy?” I asked Brendan at one point.